Anne Rice is the international best-selling author of The Vampire Chronicles, the Christ the Lord novels, The Mayfair Witches, Exit to Eden, and Angel Time. Her first novel, Interview with the Vampire, was published in 1976 and has gone on to become one of the best-selling novels of all time. It was also adapted into a blockbuster film staring Tom Cruise, Brad Pitt, Kirsten Dunst, and Antonio Banderas. Her newest series is called Songs of the Seraphim. With about 100 million books sold, Anne Rice is one of the most-read authors in the world. Matthew Peterson: Hello there, This is Matthew Peterson, the host of The Author Hour: Your Guide to Fantastic Fiction. Last week I had Terry Brooks, Tracy Hickman, Margaret Weis, R. A. Salvatore, and Brandon Sanderson. This week’s theme is classics in fantasy and science fiction with Anne Rice, Ursula K. Le Guin, Brian Herbert, Kevin J. Anderson, and Orson Scott Card. You know, this is my fifth episode and I have yet to actually introduce myself, so I thought I’d take a moment to do that, since I do have a couple minutes before the interview starts. I’m the author of Paraworld Zero, a fantasy novel about a 12-year old Earthling boy who gets trapped onto a new world where he discovers he can do magic. Now, Paraworld Zero came out last year, it hit the BarnesAndNoble.com bestseller list, won, placed or honored in about 15 contests, but right when it was published, the poor economy basically killed my publisher. They sold the first print run almost instantly but then stopped fulfilling orders because they’d run out of money and couldn’t print any more. Now I was touring the country at the time, doing every single promotion you can think of: radio, TV, newspaper–you name it. I actually spent over $100,000 from my own pocket to help spread the word, so as you can imagine it was a huge nightmare to stand before audiences of like 500 kids and be told that they tried to order my book but couldn’t. Anyway, my publisher and I parted ways, and I finally got my rights back to the book. Fortunately, it’s still available as an ebook and audiobook at places like audible.com and overdrive. Now the plot thickens. I wrote the second book called Magical Learning and was just about to start looking for a new agent and publisher when my house was destroyed in a fire. That was about 4 months ago. You’ve heard the saying, when it rains it pours. That same week I got called to jury duty. But I also got a phone call from VoiceAmerica, inviting me to be the host of The Author Hour, and you know the rest of the story. But things are looking up for me. Just last week, I got an offer from a publisher in India to publish my Parallel Worlds series in that country. So now that things are settling down I’m excited to get back to the hunt for a new agent and publisher in the states. And I’ll keep you posted on my progress. So that’s me, Matthew Peterson, the host of The Author Hour. Now let’s get to the interviews, shall we? 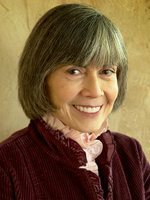 My first guest is Anne Rice, International bestselling author of The Vampire Chronicles, The Christ the Lord novels, the Mayfair Witches and Exit to Eden. Her first novel, Interview with the Vampire, was published in 1976 and has gone on to become one of the best-selling novels of all time. With about 100 million books sold, Anne is one of the most-read authors in the world. Thanks for being on the show today, Anne. Anne Rice: Oh, it’s a great pleasure, thank you. Matthew Peterson: You know, Interview with the Vampire has really kind of become a modern day classic in a sense. It’s a very dark book, but you’ve come a long way since then, both in your beliefs and in the content of your books. I wanted to go way back to that first book and ask you a question: Why did you write Interview with the Vampire? Anne Rice: Well, it really started with a whim. I was sitting at the typewriter and I thought, “What would it be like to interview a vampire? What would it be like if you could get him to tell you what his experience really was?” And I did this in a short story, I revised the short story, and then the short story started to grow into a novel. And I found I was able to discuss everything that was on my mind, in that fantasy framework. It was a gateway for me to reality. Matthew Peterson: You know, The Interview with the Vampire was on TV the other night, and I’d never seen the movie. It was just on local TV. I had no idea that there were so many famous actors in there: Tom Cruise, Brad Pitt, Kirsten Dunst, and Antonio Banderas. Anne Rice: Well, David Geffen, the producer, really brought together the best talent he could find for that movie. He did a stunning job, really. I was very grateful. Matthew Peterson: Oh yeah. You couldn’t ask for a better cast, there. I hear there’s talk about another movie, though. Or is that a rumor? Anne Rice: Well, it’s just talk right now. But we are always attempting to set something up. And I have very good agents. And when I do have some really concrete information, I’ll put it on my website, but right now it’s just rumor, really. Anne Rice: I think something will happen, though. I’m very optimistic. Matthew Peterson: Oh, yeah, yeah. Definitely. Do you plan on revisiting the Vampire Chronicles? Anne Rice: No. I wrote 11 books with those characters and I loved doing it, but I really am finished. I have no more stories to tell from the point of view of Lestat and Louis and Armand, and those characters. I had to move on, really. When you’ve told all you have to tell, in a certain way, you have no choice but to move on to new themes and new obsessions and new passions. If you don’t do that, you’re being dishonest. Matthew Peterson: You really did move on. You started writing the Christ The Lord novels. Anne Rice: Finished two of them and it’s going to be a long while before I can do the third. But it’s a great passion of mine to do those. Matthew Peterson: Well, going from vampires to writing about the life of Jesus Christ is quite a shift in gears. What was your motivation; why did you write Christ the Lord in the first place? Anne Rice: Personal conversion. The fact that faith came back to me and I surrendered to my own belief in God and my own love of God, and my desire became to write for God, really, to write a fiction in which God was a reality, in which salvation was a reality. And I went right to the source of all my beliefs: I went to Jesus Christ and wanted to write two biblically correct novels about Jesus that were nevertheless very lively novels. And that was what I attempted to do with those two books. To write really for people that had never read anything about Jesus and for people that read about Him everyday, to write for them all. To say, a novel can be done in this way about Jesus Christ. Matthew Peterson: Well, what better author to do it! A lot of people know you. And you are definitely an example, there. You can write whatever you want. Anne Rice: Well, I’m certainly trying to do that. You know, novels have to overcome a certain prejudice out there. There are people that will never pick up my vampire books just because they don’t want to read horror fiction, and there are people that won’t pick up my Christ the Lord novels because they don’t want to read about any Christian themes. But the only thing a writer can do, you just keep going. You keep writing what you love, and you do what you want to do and there will be people who will want to read it. You have to have that confidence. Matthew Peterson: And this third book that you’re writing, why is that going to take a little bit longer? Anne Rice: Well, the third book on Christ the Lord will involve Jesus on the road, the period of teaching and miracles. And so it’s going to take a lot more research and a lot more thought. But in the mean time, I’ve developed another Christian series called the Songs of the Seraphim. Matthew Peterson: The Songs of the Seraphim. What an interesting name! Anne Rice: Well, you know, it was inspired by people who had said that our lives are, in a sense, the songs that heaven sings. What we do in our lives is like a song that we’re singing for our creator. And that inspired me somewhat to name it Songs of the Seraphim. The Seraphim, of course, are powerful angels who are before the throne of God. They’re beautiful angels and they can do other things besides be at the throne of God. They can come to Earth, and they can have an affect on people’s lives. There’s nothing to say they can’t. And so I wanted to create a fictional seraph who comes to a hit man, actually, Toby O’Dare, and welcomes Toby to change his life, to stop being a hit man and give himself over to God and to start working for the angels. And I’m very excited about the series, because it gives me an opportunity to do so many things I want to do. You know, write in a contemporary voice, write about Toby’s life as an assassin, write about Toby going back in history to work for the angels in different times. All of that, to me, is very exciting. I’ve always loved historical settings and different periods in history in my novels. And it’s a lot of fun. I’m having a great time with it. Matthew Peterson: Well, Kirkus Reviews did a review: "Time travel, ultraviolence and medieval madness--divine intervention rendered fantastically by Rice." Anne Rice: Great. I love that. I love whoever wrote that review. Matthew Peterson: Yeah. Very interesting. How many books will be in the series? Anne Rice: I hope a lot. Really, you know, my earlier series, they were never planned to be a series, but this really is. And so I would really like to keep the books fairly short and write quite a few of them and really develop a lot of themes about Toby’s life as he works for the angels. His own life in the 21st century is bound to change, and I’d love to get into that, as well as into many different periods back in history where Toby will go to do the assignments he’s given by the seraphim. Anne Rice: It’s true, yeah. He’s a very well educated guy and he loves music and he loves reading history. The angels pick these people, according to my fiction, they pick these people because of the traits they have. And Toby has special education in the field of history. Matthew Peterson: Ah. Okay. What’s one of the tasks that he might have to undertake? Anne Rice: Well, Toby, in this first novel, Angel Time, he’s sent back to a medieval community in England to try to foil a plot, really, of the locals to hurt this couple. They’ve accused this Jewish couple of murdering their child because she converted to Christianity and the couple is innocent. And Toby is sent back there with the assignment, “Stop this from happening.” It’s sort of like a mission impossible assignment, you know. Anne Rice: Make sure that this couple doesn’t get . . . you know, that they’re not the victims of mob violence, because they didn’t kill their child; they’re innocent people. And do what you can to stop this. And that’s what Toby does. I don’t want to give away what happens, but, I mean, that’s what he’s working on. How can he do that? He slips into that period of time looking like a priest of that period, a medieval priest. And he interacts with people and does what he can to foil that plot. Matthew Peterson: Sounds like a very interesting idea. I could envision it as like a TV series, or something. Anne Rice: Oh yeah. I would love it if it became a TV series. Anne Rice: Maybe Alan Ball would like to do it on HBO. Matthew Peterson: [laughs] That would be great. Well, Anne, what other projects to you have in mind? Anne Rice: Well, I want the Christ the Lord books, above all, to be finished. To do all of the life of our Lord. And then I want to do the Angel Time books, or Songs of the Seraphim. I want to do quite a few of them. I have other historical novels that I would like to write that are very much Christian in theme. And I would love at some point to do a big Christmas book of some kind. Anne Rice: A work of fiction that has Christmas and the celebration of Christmas as its theme. All of these things are sort of in my mind, you know. My mind never stops. It goes on and on. Matthew Peterson: Yeah. Well, what was the event that really helped you to come back to Christ? Matthew Peterson: Yeah. Well, it sounds like you’re on your way. Well, thank you so much, Anne, for being on the show today. It’s been a real pleasure. Anne Rice: Oh, I’ve enjoyed it too. Thank you. Matthew Peterson: I’ve been speaking with Anne Rice, International bestselling author of The Vampire Chronicles, Christ the Lord, and now Angel Time. Thanks again for being on the show, Anne. Matthew Peterson: Okay, so, after the show, go to www.TheAuthorHour.com to listen to the bonus questions. Don’t go away. I’ve still got Ursula K. Le Guin, Brian Herbert, Kevin J. Anderson, and Orson Scott Card.